Join an epic India adventure that takes travellers as part of a small group overland on a round-trip from Delhi. This is a fabulous opportunity to really open up some of Rajasthan’s best loved landmarks and culturally colourful cities, including Varanasi, Pushkar, Udaipur and Jodhpur. This is your chance to step inside one of northern India’s most exciting regions where mud fortresses, towering temples and the ghats of the Ganges collide in a kaleidoscope of indelible images to ensure you’ll never think about India in quite the same way, ever again. Desert safaris by camel and guided visits to the Taj Mahal add to the experience of travelling as part of a small group with numerous chances to meet local people, on their level, always extending cultural boundaries as well as creating some unforgettable moments. 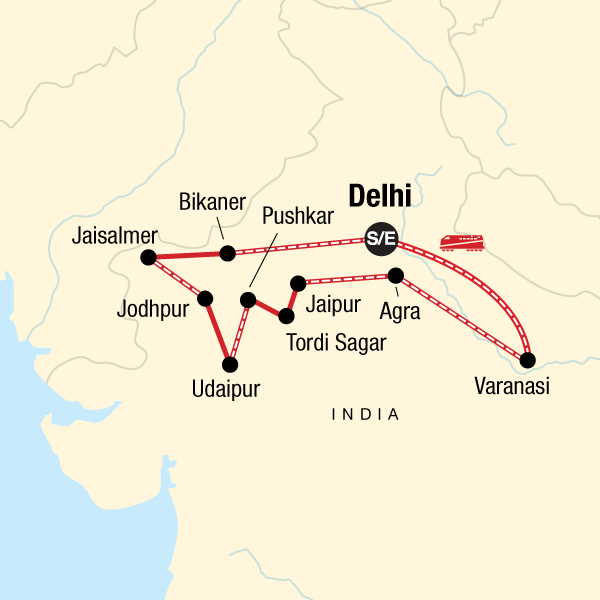 Overland touring around India is an absolutely intoxicating experience and throughout this 20 day journey you’ll be accompanied by a dedicated group leader who takes the stress out of travel and allows for a greater understanding of what you're seeing along the way. Supporting local businesses: There are a multitude of opportunities to support local businesses on this trip. From the colourful markets to the bustling food stalls and cafes amid craft bazaars, the choices for eating and handicrafts are endless and the money is staying in the local economy - a vital way for tourism to make a positive impact. Activities that take you to markets, locally-owned restaurants, and villages are vital to the local peoples’ ability to truly benefit from tourism. Our style of trip, travelling and eating with the locals, puts you right at the heart of Indian culture. Vegetarian? You’ve found the right place, India is a haven for vegetarian food, and a delicious way to tread lightly on the planet. Many tours incorporate community projects as a way of supplementing community income and supporting community development projects. In 2003 we founded a non-profit organization as a way for our travellers and our company to give back to the people and places we visit. We develop community projects around the world in the areas of health, education, small business development and environmental conservation. Funds are raised through traveller donations and fundraising. The company pays all administration fees which means that 100% of each individual donation goes directly to the community projects. Each year, we continue to support and develop new partnerships with more community projects and community-based tourism initiatives worldwide, in Latin America, Asia and Africa. On most tours, including this one, you have the option to visit a project as part of your trip. Tour leaders provide travellers with information about local environmental issues in their respective regions, and provide suggestions of how we can best protect the local environment and culture. To reduce the amount of waste created on tours, tour leaders also encourage travellers to use refillable water bottles instead of disposable plastic, cotton tote bags, reusable batteries, etc. We also include destination-specific information in our guidebooks, which are provided to each traveller including information particular to the local culture and environment and tips on how to be a responsible traveller.